Back in September 2003, Russia joined the Bologna Process aimed at harmonizing European education standards. Meanwhile, there is no consensus amongst those in Russia’s academia as to whether the move was justified. On Sept. 1, hundreds of thousands of students in Russia started their first year (or returned for yet another year) at a variety of higher educational institutions across the country. In quantitative terms, this marks a tremendous break from what we had some 20 years ago, when higher education seemed to have gone out of fashion forever. In the turbulent 1990s, teenagers fresh out of grade school wanted to do anything - set up their own private companies, join gangs, stage revolutions – other than wear out the seat of their pants in universities in the search for knowledge. These days, the trend is quite the opposite: higher education is back in vogue, and a degree has become almost a must-have for anyone's life plan. What has remained unchanged, however, is that only a minimal percentage of school graduates are actually heading to universities for the knowledge. Most of them are only pursuing what is called “the sheepskin effect”, or a diploma. Should Russian universities pay much attention to rankings? More or less a specialist? Naturally, such aspirations were bound to devalue higher education in the eyes of potential employers. Consequently, where a university degree used to be a must for any job candidate, work experience has now become the most important criterion. With higher education institutions popping up across the country like mushrooms after the rain -- producing batches of job candidates with identical resumes -- it is extremely difficult to choose, out of a multitude of almost identical brands, those universities which actually prepare good specialists. Unfortunately, the Russian educational system is such that even a degree from a prestigious school (like the Moscow State University or the Higher School of Economics) does not guarantee a proper educational background. There are a number of reasons for this, not least of which are the widespread practice of cheating among students (which, mercifully, has been waning recently) and the protectionist practices among university administrations (typical of private educational institutions). Russia's transition to the Bologna Process (next year it will be 10 years since Russia signed the declaration) smoothened the situation out to a certain extent, though it clearly did not have the miraculous effect officials had hoped for. Simply put, most universities produce a string of so-called “jacks of all trades, but masters of none.” The situation is a fraction better with reputable state-run universities. They generally offer a wider selection of academic majors, where students can choose between a research specialties and specialties in highest demand on the market. Still, this is no more than a drop in the bucket of dreary uniformity produced by other institutions. By the same token, Russia is in a similar position when it comes to another distinguishing feature of the Bologna process – education abroad. Celebrated universities have long since established international ties. Irina Ipatyeva, a graduate of the Higher School of Economics National Research University, says: “My university runs extensive student exchange programs with Great Britain, Germany, France, and a number of other countries. So when the time came to decide, this choice proved to be the most difficult matter.” Meanwhile, the chances of studying abroad with private universities, which have only existed for 10-15 years at the most, are often no more than fiction. Since the Bologna declaration was signed, no mechanisms have been introduced to ease the integration in Russia. This is what Germany - a country closely watching the quality of its education - is facing. What can then be expected of the average Russian university, blemished by cheating, petty bribery and an inefficient system of practical training? Clearly, rectors of western universities can hardly be expected to assume that a person with such a degree is any more intelligent than a carrot. 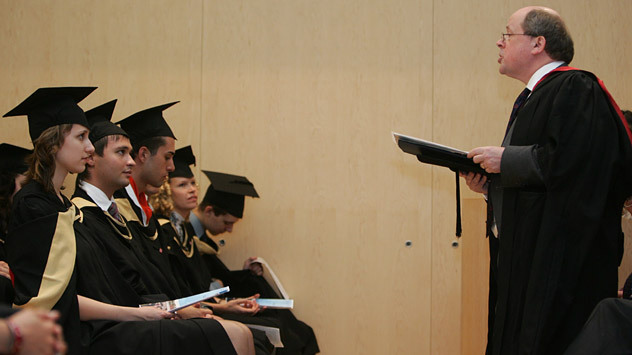 That is, Russian students do not have the chance to take advantage of the two-cycle education system, because of the unfavorable reputation (if it has one at all) of their alma maters. In this light, the education reform actively touted by the Russian Ministry of Education, aimed at dramatically decreasing the number of educational institutions while improving the quality of the surviving ones, seems a fair measure. Indeed, if education does not bring knowledge and opportunities, then what is its purpose?